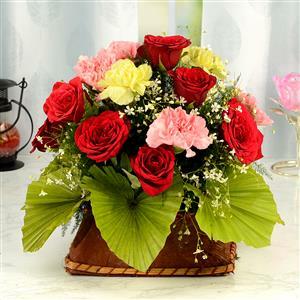 Send Basket with lovely flowers to Chennai. Gifts to Chennai. Send Flowers to Chennai. Description : Convey your warm regards and love to your near and dear ones in Chennai through Gift2Chennai.com. This enthralling flower basket includes 8 Red Roses, 6 Pink Carnations and 2 Yellow Carnations. The collection is arranged on a wicker Basket with green ferns, baby breadth and ribbons. Send Gifts to Chennai and let your gifts adorn the face of your loved ones with the priceless smile.